Apple has updated their online store to launch sales of their updated Mac Pro, which was announced this morning. 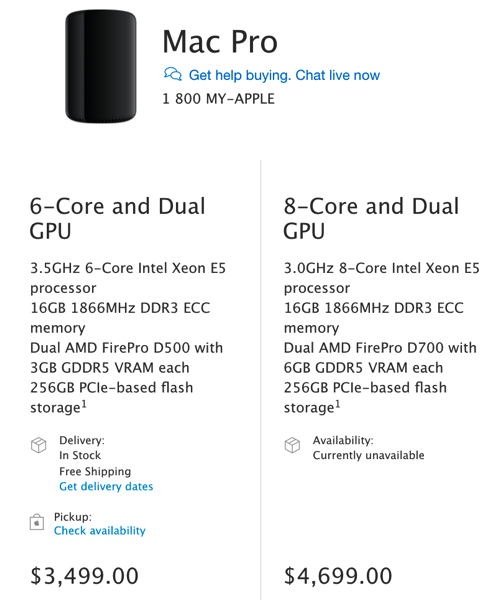 Apple.ca is showing the 6-core and dual GPU Mac Pro available for $3499 CAD, listed as in stock and available for pick up at Apple Stores. The other 8-core and dual GPU upgrade costs $4699, but is showing as “currently unavailable”. Both models are priced the same as before. If you want to pick up older versions of the Mac Pro, this morning more models hit Apple’s refurbished section, starting at $2459 CAD. Apple this morning told select journalists a new Mac Pro design is coming (not this year), while a new pro iMac line is slated for this year, along with Apple-branded pro displays.